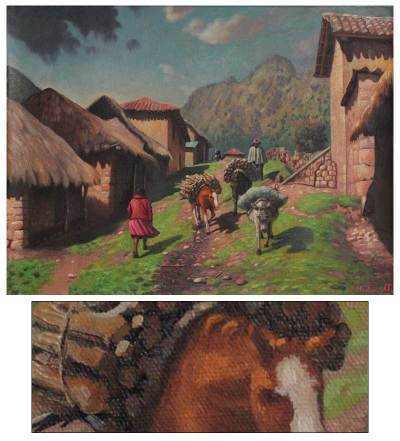 Realist Oil Painting, "Village from My Land"
Carrying firewood, donkeys travel cobbled paths through the village of Condorama, in the Andes. "I wanted to paint about it because I really like the way customs are preserved in villages such as this one, where adobe houses have thatched roofs and people wear traditional clothes," confides Alcides Medina. He blends a palette of brown, red, green, blue and gray hues to create a vivid composition. Titled "Pueblo de mi tierra" in Spanish. You can find 'village from My Land' by Alcides Medina Umeres in paintings categories such as Landscape Paintings, Realist Paintings and Oil Paint Paintings. Enjoy exploring these sections for other Novica treasures.